IT the sunshine sector, has become need of the hour in current time and continues to chart double digit growth. Last few years have seen an explosive demand for IT enabled services, largely driven by faster GDP growth, sectors such as telecom, banking, insurance, retail, health care, tourism and automobiles are contributing to a large share of GDP. Organizing conference on such a topic, which is the need of time, is always appreciable. 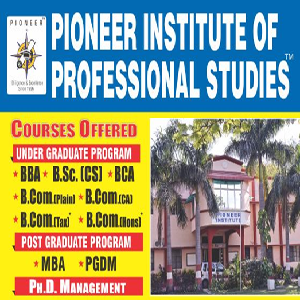 Pioneer Institute of Professional Studies is putting in continuous effort in this area for the benefit of academia and industry. With this objective we at Pioneer organized research papers teach us to acquire basic writing skills, develop careful reasoning and learn to apply appropriate data analysis. Good writing is essential to success in the kind of careers we would likely want to pursue. It goes without saying that excellence cannot be achieved in isolation. Excellence could be the product of combined and synchronized efforts of various disciplines. Pioneer Institute of Professional Studies in its 5th National Conference has captured the theme “IT: Issues and Challenges. It was a moment when the experts from Industry and Academics participated and shared their rich experiences and helped in making the event a great success. The Chief Guest and keynote speaker was Dr. P.B. Sharma, Vice Chancellor, RGPV, Bhopal Special Guest was Dr.P.C.Sharma, Executive Director, Bansal Group of Institute, Indore..
Conference Advisor was Dr. P.N. Mishra. Session I was based on “Knowledge Management” chaired by Dr.P.K.Chande (Director General, Oriental Group of Institutions, Indore). Session III was on “Web Application for Organizational Excellence” and was chaired by Prof.D.A.Mehta. ( Head, Dept. of Computer Science and Engineering, SGSITS, Indore). Session IV was based on the topic “Artificial Intelligence and Neural Networks ” and for the Session Chair person was Dr. Nirmal Dagdi (Principal, S.D.Bansal College of Technology, Indore). At PIPS there has been an on-going commitment to address pertinent issues and challenges that affect all in diverse vocations. By designing conferences that bring together gifted resource people and concerned members of the academic community, we offer opportunities for life-long learning and professional development with these lines conference chairman Dr. V.K.Jain gave the detailed description of the conference. Conference Secretary Prof. Neeraj Paliwal presented the report of the conference and conference joint secretary prof.Anish Choudhary presented Vote of thanks.